This medium some months back published an article titled Anxiety over the indefinite suspension of Parradang. This piece is a follow-up to that article. That the indefinite suspension of the Comptroller General of Immigration has now been converted to retirement with full benefit is no news. This much was confirmed by sources at the Federal Ministry of Interior (FMOI) who cited a correspondence conveying same dated July 26, 2016 and signed on behalf of the Hon. Minister/Chairman of the Civil Defense, Fire, Immigration and Prisons Board (CDFIPB) by the Director/Secretary of the Board. The case of Mr. David Parradang was a classic case of calling a dog a bad name just for the purpose of hanging it. Investigation by this medium revealed that Parradang’s fate may have been different if he had been less patriotic and loyal to the flag and his fatherland but more to the machinations of evil men and women who pulled the strings from the FMOI, the CDFIP, very powerful and influential technical partners/service providers to the NIS, especially CONTEC and politically-minded officers at the NIS. He was done in by forces who from day one made the NIS ungovernable because he wasn’t their favoured candidate for the post. Even after the exit of the last dispensation, agents of the retreating administration left elements who saw to it that the minds of the incoming administration were adequately poisoned to sound the death knell. It would interest readers to know that recent events have vindicated this fine gentleman of all false accusations to wit that he was culpable in the botched, ill-fated and avoidable NIS recruitment saga of 2014 and that he solely conducted the so-called illegal NIS recruitment by the presidential committee set up to assist the CDFIPB in conducting a more credible and transparent exercise. It’s no longer news that those implicated in the botched 2014 recruitment exercise have been arraigned before courts of competent jurisdiction and government has directed that all those recruited by the presidential committee in 2015 be recalled to commence training. A cursory look at Parradang’s stewardship as the 13th Comptroller General for two years reveal that he was really one cut out for the job. He joined the NIS on October 14, 1982 after bagging a Bsc Second Class Upper degree in Sociology from the University of Jos as an Assistant Superintendent and rose through the ranks to his exalted position as the Comptroller General on June 10, 2013. At the time of his appointment, one can say that the CG was most suited for the job. After his training at the Immigration Training School, Kano State Command, records show that he served at various strategic formations and posts namely Kano State (1983-1987); Murtala Mohammed International Airport (1987-1989); Lagos State Command (1989-1992); Passport Control Office Ikeja (1992-1994); Kwara State Command (1994-1995); and Zone ‘A’ Headquarters, Lagos (1995-1997). 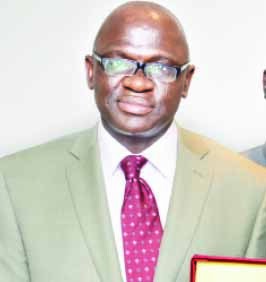 Parradang also headed ECOWAS Section, served as Public Relations Officer between 1997 to 1999 at the Lagos State Command and as Special Duties Officer (1999-2001) and Special Assistant to the Comptroller General at the Service Headquarters, Abuja (2001-2006). The former CG also headed Kano and Enugu state commands as Comptroller in Charge (2006-2007 and from 2008-2010); served as Comptroller Admin. (2010-2012) and Assistant Comptroller General in charge of State Coordination (2012-2013). It was this rich and robust background and a high cerebral endowment that Parradang brought to bear on his tenure as CG of the NIS. One would not be far from the truth by describing his tenure as golden for two reasons. He became CG in the year of the Golden Jubilee ( which was celebrated with pomp and pageantry in August of 2004) of the NIS (1963-2013) and secondly his legacies would be a point of reference at the NIS for almost eternity. His tenure recorded many firsts in the annals of the history of the service, a feat that made many keen watchers credit his tenure with the rebirth of the NIS. What are the legacies of this rich era? The mandate handed Parradang by the then President and Commander-in-Chief of the Armed Forces, Dr. Goodluck Ebele Jonathan, GCFR, on his appointment as CG was to “restructure, re-engineer and transform the NIS to be better positioned for efficient and effective discharge of its statutory functions”. It is from this mandate that he developed his vision and mission and the famous Four Point Agenda. His vision was very clear: “To develop the total immigration officer by re-orientation and general capacity building so as to be able to hold his own and render world class service” and the mission “To secure the Nigerian border and entrench a robust internal control by deploying cutting-edge technology that is sustainable and adaptable to our peculiar clime”. (D) Technology – Deployment of cutting-edge technology that is sustainable and adaptable to our local environment as it affects all immigration operations. This four-point agenda formed the terms of reference Parradang sold to the NIS through an ad hoc Blue Print Committee to fashion a road map towards repositioning the service for effective and efficient service delivery and adding value to the security architecture of his fatherland. This committee, ably headed by Deputy Comptroller General, Joseph Olaitan, a cerebral walking encyclopedia on immigration matters, had other equally seasoned and erudite officers as members. It requested memoranda from officers and men from all immigration formations within and outside the country, the feedback of which was encapsulated in a report submitted by the committee on July 10, 2013, exactly one month from the appointment of the CG. It is through the prism of this document, fashioned in line with the four-point agenda, that any meaningful assessment of Parradang’s tenure will be done. Concerning the Emergence of the Total Immigration Officer, an issue that arrested the attention of Parradang on appointment was the pervading low morale and indiscipline among officers and men of the service. The reasons for this state of affairs are well known and include poor conditions of service in terms of poor remuneration, deplorable working conditions coupled with career stagnation or delayed or lack of promotion. Knowing fully well that it will be a tall order trying to single the NIS out for better remuneration, he immediately set out to put in place a welfare scheme to cushion officers against the harsh effects of the economy and to encourage the culture of saving among them. In the long run, he enhanced the profile of the NIS from a mere service-oriented agency to a revenue yielding organisation with the ultimate aim of appealing to government to cede a percentage of revenue generated to augment officers’ remuneration and general improvement of their working condition. As regards delayed promotion and anomalies associated with promotion interviews in the NIS, the former CG decided to constructively engage the CDFIPB to minimise such incidence. The following form Parradang’s legacies in the area of boosting the morale and confidence of officers and men with the aim of enhancing their effectiveness and efficiency on the job. In furtherance to his inclusive leadership style, he maintained an open door policy by regularly meeting with officers and men at the monthly parade where everyone was free to interact and seek answers to policy and administrative matters. Parradang also ensured prompt and accurate payment of salaries and allowances and in this regard, salaries were paid on or before the 25th of every month. He introduced the payment of an annual N20,000.00 across board to all officers and men to cater for official communications bordering on security. He initiated the establishment of the first ever Nigeria Immigration Service Staff Multipurpose Cooperative Society (NIMCOS) Limited, to cater for the welfare needs of officers and men while the establishment of an NIS Micro Finance Bank was in view. His tenure also witnessed the commencement of the first nursery, primary and secondary school at the service headquarters with the intent of bringing affordable but quality education services close to officers and men. On the healthcare front, more drugs and equipment were procured with plans to upgrade the existing clinic to a health care centre. To curb anomalies associated with promotion exercises, Parradang insisted that promotion of officers and men be based on merit with due regards for precedence. He initiated disciplinary action against some officers alleged to have fraudulently tampered with their last dates of promotion in order to qualify for the next promotion interview. In the same vein, he initiated an investigation that revealed that some officers and men either joined the service with fake credentials/academic qualifications or while in service, doctored their records to influence upward mobility. In stemming stagnation, his tenure witnessed an avalanche of promotions. Between 2013 and 2015 alone, a total of 39 Comptrollers were promoted to Assistant Comptrollers General, 76 Deputy Comptrollers to Comptrollers, 142 Assistant Comptrollers to Deputy Comptrollers, 291 stagnant Chief Superintendents were promoted to Assistant Comptrollers. Also a total of 5,799 officers were promoted in the superintendent and inspectorate cadres with stagnant inspectors well considered within the years under review. The rank and file was not left behind with the total of 8,228 promoted. Regarding capacity building, a total of 2,391 officers enjoyed various categories of training and re-training in 2014 which is an increase of 50 per cent compared to the previous year. A total of 1,016 personnel were granted permission to further their studies in 2014 compared to 390 the previous year. The ex-CG’s efforts at restoring discipline in the service was demonstrated by the immediate redeployment of some Passport Control Officers (PCOs) on assumption of duty due to either weak supervision of officers under their charge or questionable conduct. In 2014 alone, a total of 318 disciplinary cases were received and dispensed with compared to 174 the previous year. In the same year, 31 personnel were dismissed, three suspended, 20 had their appointments terminated, 37 had their salaries stopped, seven warned, nine de-ranked, one interdicted and 75 disciplinary cases were still ongoing in 2015. This rich tenure witnessed the re-introduction of sporting activities in the service beginning with a fortnightly workout/exercise at the SHQ to ensure that officers and men are physically and mentally alert to carry out their duties. It is interesting to note that state commands followed suit enthusiastically. Parradang was the first CG to commence the construction of a sporting facilities complex comprising a football field, volleyball, basketball, tennis and badminton courts at the service headquarters. This was borne out of his belief that only a fit, agile and healthy workforce can be effective and efficient to be able to grapple with the demands of a regimented paramilitary service . In this vein, he introduced the inter-directorate sports competition at the service headquarters which commenced on May 14, 2014 featuring games like football, volleyball, badminton, table tennis and basketball. These efforts in the development of sports paid off in no time as the service won 21 laurels in different sporting competitions in the federation. In the area of policing and manning the country’s extensive and expansive borders the following is the legacy of Parradang’s tenure. He obtained government’s approval for the immediate establishment of a Border Patrol Corps and introduced suitable fatigue complete with protective gears and security scanners. He established 30 additional control posts across the country to complement the existing 84 control posts totaling 114; established 27 additional patrol bases bringing the total to 72 patrol bases across the country thereby significantly reducing the distance between control posts and making border patrolling more watertight and a lot easier. He also deployed Jeeps, All Terrain Vehicle (ATVs), Porter Cabins and radio communication gadgets for border operations; enhanced active participation of the service in the anti-insurgency war codenamed Zama Lafiya and deployed 192 vehicles for effective and efficient service operations. On internal monitoring, his tenure sustained ongoing repatriation of irregular/illegal immigrants all over the country with over 2,454 irregular immigrants repatriated and nine deported in 2014 alone. He also decongested the issuance of the Combined Expatriate Resident and Aliens’ Card by constituting a task force that cleared all backlogs by expediting the issuance of green cards with a database created for all those captured. Parradang also got approval for hotel registration in line with the Aliens’ Regulations. Moves were under way to make available mobile scanners for use by hoteliers to capture resident and visiting facilities that would be transmitted to the NIS database. In the area of the use of technology to bear on the operations of the NIS, the following form the achievements under Parradang’s tenure: installation of Passenger Registration System (ePARS) at the Akanu Ibiam International Airport, Enugu and other airports used for Hajj operations like in Bauchi, Maiduguri, Sokoto, Ilorin, Katsina, Kaduna etc to facilitate automatic clearance, monitoring and authentication of e-passports and other travel documents. The NIS Data Centre that facilitates real time monitoring of all online payments accruing to the service and the test-running of an Automated Customer Queuing System at the Passport Control Office, Abuja for a first-come-first-served treatment of applicants. Other achievements in this regard include fortifying the service headquarters against possible terrorist attack by installing automatic scanners and security bollards to monitor and control human and vehicular movements. Other notable developments in this regard include the introduction of a new domain established to cater for official emailing and guaranteeing secure communication among officers and the restructuring of visa on arrival portal. There was also the establishment of a Mini Resource Training Centre for the Planning Research and Statistics (PRS) Directorate where staff of the directorate received training on ICT programmes to aid professionalism in the service; installation of High Frequency (HF) Voice and Data (CODAN) communication radios at the service headquarters and the on-going pilot project involving the deployment of the command and control within the SHQ connecting to Illela for real time viewing and monitoring of control activities. The era also witnessed the provision of Electronic Data Management System (EDMS) for archiving e-passports and electronic archiving of passport and passport files which is an additional window in passport administration so that all documents attached to each passport application could be retrieved in real time whenever the need arises. The use of technology was also deployed under Parradang’s administration in arresting anomalies associated with recruitment exercises as demonstrated during the 2015 employment exercise conducted by the presidential committee. That recruitment exercise remains the most credible, transparent and rancor-free in the annals of the NIS. The ex-CG had proposed same to the board for adoption in the conduct of NIS promotion interviews which is fraught with so much anomalies bordering on favouritism, nepotism and outright fraud with its attendant implications for discipline. In the area of revenue generation, the Parradang administration also recorded huge successes in that there was remarkable and steady increase in revenue generation by the service from N9,084,525,208.88 locally and $13,906,549.02 off-shore to N13, 433, 157,711.17 locally and $13,078,625.20 off-shore and N16,058,384,154.00 locally and $15,346,980.00 off-shore in 2012, 2013 and 2014 respectively. This feat was achieved by an overhaul of all revenue generating sections. The management and allocation of store items to state commands and other formations became prompt, transparent and accountable with the ultimate aim of computerising its operations to minimise waste and fraud. Parradang’s tenure also witnessed an increased funding to all state commands and operational formations of the service thereby facilitating smooth running of day to day operations without let or hindrances. Beautification of the service headquarters did not escape the attention of the ex-CG who insisted on the restoration of the master plan of the service headquarters complex. He initiated the naming of landmarks and monuments after some eminent personalities. Landscaping with designated pathways, the planting of trees and flowers and the construction of a befitting gate all enhanced a warm and welcoming ambience at the NIS Headquarters. The service also owes it to Parradang’s era the commencement of construction of the first NIS Conference/Resort Centre Complex complete with multi-media facilities and a modern armoury. He also enhanced constructive engagement with foreign missions and international organisations by sustaining support programmes and partnerships with UNODC, IOM, the Spanish and other embassies in the country. Parradang also strengthened the legal framework by seeing to the speedy passage of the Immigration Act, 2015 and the repeal of the 1963 document that has become obsolete and out of tune with the demands of modern migration management. He also facilitated passport and visa reforms through the introduction of visa-on-arrival to cater for foreign investors and busy international business men and women and the abolition of re-entry visa in line with global best practices; the enhancement of the security features of the Combined Expatriate Resident and Aliens’ Card together with the roll out of New CERPAC centres from the existing six to all states with the aim of bringing NIS services close to stakeholders. Introduction of reforms in e-passport issuance and pricing that accommodates low income earners and the aged. Launching of 64-page e-passport that is gender sensitive in conformity with ICAO standard and best practice. Establishment of new passport issuing offices beginning with Warri, Delta State with a view to bringing NIS services close to Nigerians. Re-designing and launching of a new embarkation and disembarkation card in line with ICAO standards making it machine readable. In 2014, the number of foreign missions with Immigration Attachés and passport issuing facilities increased from 33 to 36. He obtained approval to send 18 NIS officers to nine foreign missions and deployment of same to facilitate acquisition of e-passports by Nigerians in the Diaspora. The Parradang era also saw the emergence of a robust, dynamic and proactive public relations unit that was able to project a positive image of the service to the outside world. Knowing the benefit of capacity building, Parradang facilitated the attendance of courses on strategic communication and the 2011 Freedom of Information Act for officers of the unit. The technical staff also attended training sessions at the NTA/TV College, Jos. Achievements recorded here include the commissioning of the NIS documentary series together with the publication christened The Nation’s Gatekeeper which was a quarterly periodical showcasing activities of the service to the general public. Others include the establishment of the NIS Call Centre, a feedback and enquiry medium that facilitates easy communication between stakeholders and the NIS in real time. The PR unit was also able to add value to the social and recreational life of officers and men by the introduction of the first ever end of year social and gala night, a forum created for officers and men together with stakeholders to unwind. The foregoing are rich legacies Parradang is bequeathing to the NIS. He has really raised the bar and it should be mentioned that all these laudable feats were achieved in just two years! An alumnus of the National Institute for Policy and Strategy Studies (NIPSS) and custodian of Officer of the Order of the Niger award, Parradang’s case remains once again a case of throwing away the baby with the bath water. His submission at the Senate Public Hearing on the recruitment saga of March 15, 2014 was forthright and engaging. It was there that he told the world that the exercise “was not immigration-driven”. His candor and integrity endeared him to Nigerians with prominent citizens praising his courage. It remains a cause for concern to many that today he is being rewarded with the rough end of the stick for confronting those who personified the impunity and corruption of our recent dispensation. His premature retirement may be sending a wrong signal to citizens of this country that integrity, forthrightness and probity in service does not pay. To his immediate constituency, the NIS, his retirement remains a golden moment betrayed, a revolution aborted.